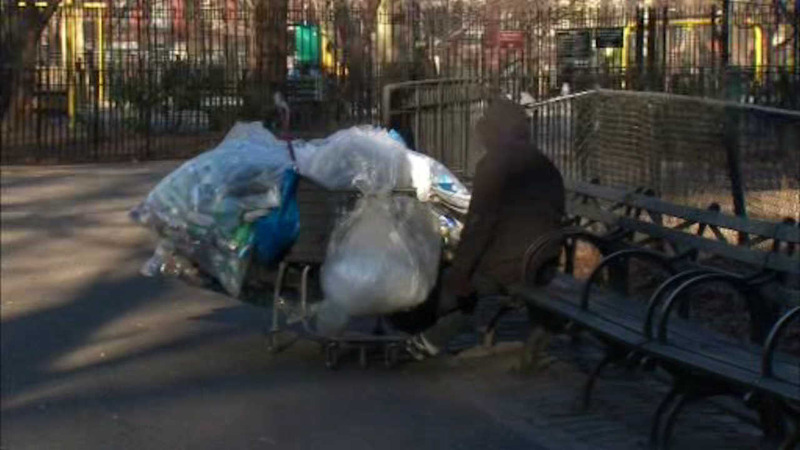 NEW YORK (WABC) -- Teams of workers from New York City agencies fanned out across the five boroughs Monday night and Tuesday night to protect the homeless from the bitterly cold temperatures. 103 homeless people were taken off the streets overnight during city outreach efforts. Only two were involuntarily removed. 173 people came into city hospitals for shelter and medical care. Mayor Bill de Blasio said the frigid weather set off a 'Code Blue' Warning. "So very vigorous outreach effort, it will clearly continue tonight and any night where it is bitterly cold," said the mayor. "I want to remind by fellow New Yorkers, if you see someone in desperate danger, if you fear they are in danger, call 911 right away and report it. If you see someone who is homeless on the street and you think they need outreach, it's not an immediate matter of life and death but you think they need to be reached and get the help they need, call 311 and we will send people out right away. " Recently, de Blasio announced a new deputy mayor, Dr. Herminia Palacio, to oversee the city's new homeless outreach effort. On the state level, New York Gov. Andrew Cuomo signed an executive order to protect the homeless in winter weather, requiring communities statewide to take homeless people from the streets to shelters when temperatures reach freezing, saying he was ready for a legal challenge from anyone who believes "people have a civil right to sleep on the street and freeze to death." A Code Blue Warning is triggered when temperatures reach 32 degrees or lower and requires shelter access to anyone in need of assistance. During a Code Blue, the Department of Homeless Services and the NYPD focus on clients on their vulnerable lists and work to contact them once every four hours to give them proper assistance. --Shelters: During a Code Blue, homeless adults can access any shelter location for single individuals. Beds are available system-wide to accommodate anyone brought in by outreach teams or walk-ins. --Drop-in centers: All drop-in centers are open 24 hours a day when Code Blue procedures are in effect, taking in as many as people as possible for the duration of inclement weather. Drop-in staff also can make arrangements for homeless individuals at other citywide facilities. --Safe havens and stabilization beds: Chronically homeless individuals may be transported to these low-threshold housing options, where they may go directly from the street to a bed.